The NordicTrack Incline Trainer X11i Treadmill of NordicTrack Fitness, having 44 in built workout apps. this commercial Treadmill is driven by a 3.8 HP continious motor. NordicTrack Incline Trainer X11i Treadmill also comes with built in workout centre that helps you in your workouts so that you can reach your goals easily. Commercial pro Motor-Built to take on the toughest training regimes, the Incline Trainer X11i features a heavy-duty drive system that delivers smooth, consistent power. Topuch Speed Control-Quick controls instantly adjust your speed from 0–12 MPH with the touch of a button. You can stay focused on your performance instead of scrolling through speed settings found on other treadmills. Workout Centre-Train for your competition the right way with workouts tailored just for you. Simply input your distance, time or calorie target and the Incline Trainer X11i adjusts your incline, decline and speed so you reach your goal! This feature is perfect for event training, reaching your personal best and sticking to your unique training program. Incline -Decline Control-Accelerate your training and weight loss with incline and decline on the Incline Trainer X11i. Commercial Treadbelt-Stretch out your stride with this extra-long, commercial treadbelt. This 2-ply treadbelt will withstand any type of training you need to beat your personal record. Weight Capacity-Heavy-duty and built to withstand incredible use, the Incline Trainer X11i will take on the daily pounding of any rigorous workout. Warranty-The Incline Trainer X11i is protected with an industry-leading Lifetime Frame Warranty, Lifetime Motor Warranty, Lifetime Deck Warranty, 5-Year Parts & Electronics Warranty and 2-Year Labor Warranty. Built In Workout Apps-Get the training you want with built-in workouts designed by a Certified Personal Trainer. Reflex Cushioning-Suspending nearly the entire length of the deck, Reflex Cushioning absorbs every impact keeping your joints and back protected and comfortable. Heart Rate Monitor-Stay in your target heart rate zone with heart rate sensors built right into the handlebars. Workout Fans-Stay cool and comfortable, even on your longest workout with built-in, oversized fans that automatically adjust the fan speed to match your workout MPH. iFit Live Technology Built-In-Combine iFit Live Technology with a 40% incline and -6% decline, plus a 10″ web browser and you get the most advanced treadmill in the world. Ipod Compatible Audio Port-Move to your favorite music with the built-in Intermix Acoustics 3.0 sound system. ToughTrain 4.5 out of 5 Excellent treadmill with excellent features, comes in an affordable price and attractive warranty. TreadmillDoctor.com 7.51 out of 10 The best just keeping getting better. With higher quality components and a HUGE running surface, the X11i makes a great addition to the incline trainer lineup. *Note: Most of the sites, stores or shopping portals listed above sell NordicTrack Incline Trainer X11i Treadmill with discounts and other exciting offers. 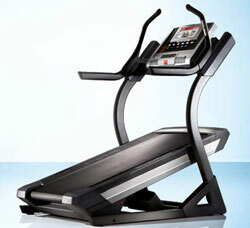 There is a possibility that the some of above websites are not selling NordicTrack Incline Trainer X11i Treadmill now. Toughtrain.com is not liable for such cases or instances. Also we do not recommend any seller for NordicTrack Incline Trainer X11i Treadmill and a buyer should buy from where he/she gets best deal with quality of products, service and on time delivery (shipment). Elegant machine. Though meant for commercial purpose, one can use it a home also with ease. Very smooth to use. The best part is its high level of resistance features. Use either inclined or decline both will offer an exceptional result. Price is a kinda worry but no harm if you get the best out of it. After a long research finally made my mind to order this Nordictrack incline trainer from amazon.com and very happy that not only it was delivered on time but was also installed accordingly. And since then (june 2013) its been running smoothly without any internal issue. It was a great buy and is worth recommending. Simply amazing ….best in the market, use it in my gym…8 out of 10.